Aberrant methylation patterns in CpG island are known to be influential in gene silencing. Histamine plays important physiological roles in the upper gastrointestinal tract and acts via the H2 receptor. We report an investigation into the effect of HRH2 promoter polymorphism (rs2607474 G > A) on the methylation of DAPK and CDH1. Non cancerous gastric mucosa samples were obtained from 115 subjects with gastric cancer (GC) and 412 non-cancer subjects (non-GC). Methylation status of genes was determined by MSP. The genotyping of rs2607474 was performed by PCR-SSCP. Methylation of DAPK and CDH1 was observed in 296 and 246 subjects, respectively. The frequency of CDH1 methylation in the subjects with GC was significantly lower in cancer lesion than in non cancerous mucosa, whereas that of DAPK methylation was not different. The allelic distribution of rs2607474 was 401GG, 119GA and 7AA. The GG homozygote was associated with a significantly increased risk for methylation of both DAPK and CDH1 (p < 0.0001 and p = 0.0009, respectively). In the non-GC subjects or more than 60 years of age, GG homozygote was more closely associated with both DAPK and CDH1 methylation. However, this genotype did not show an increased risk for the development of methylation of both genes in patients with GC. In H. pylori negative subjects, GG homozygote showed an increased risk for the methylation of both DAPK and CDH1 (p = 0.0074 and p = 0.0016, respectively), whereas this genotype was associated with an increased risk for the development of DAPK methylation in H. pylori positive subjects (p = 0.0018). In addition, in subjects older than 60 years of age, atrophy and metaplasia scores were significantly higher in the GG homozygote (p = 0.011 and p = 0.039, respectively) and a significant correlation was observed between age and atrophy or metaplasia. Our results suggest that rs2607474 GG homozygote confers a significantly increased risk for age- and inflammation-related DAPK and CDH1 methylation. Gastric cancer is one of the most common cancers worldwide and is associated with a high mortality rate [1, 2]. Several cancers, including gastric tumors, show methylation of multiple genes including E-cadherin (CDH1), death-associated protein kinase (DAPK) and cyclin-dependent kinase inhibitor 2A (CDKN2A) [3, 4]. Methylation of promoter CpG islands leads to DNA structural changes and, consequentially, gene inactivation . Many studies have identified this silencing by DNA methylation as a mechanism responsible for tumor suppressor inactivation. However, some genes are also methylated in non-neoplastic tissues due to ageing [6, 7], and it has also been suggested that gene methylation occurs during chronic inflammation in various tissues [8–10]. In gastric mucosa, it has been postulated that methylation of CpG island is induced by Helicobacter pylori (H. pylori) infection in non-cancerous mucosa [11, 12] and considered as the precancerous conditions in gastric carcinogenesis . Among several genes, DAPK, CDH1and CDKN2A are known to be frequently methylated in non-neoplastic gastric mucosa and this methylation is linked to age, H. pylori infection, histological degree of gastritis, and gastric cancer [11, 13, 14]. However, histamine, one of the active amines released in response to a variety of physiological stimuli, is widely distributed in the gastrointestinal tract including the stomach and is involved in the pathogenesis of gastro-duodenal ulceration and gastric inflammation . In the stomach, H2 receptors, although widely distributed in body tissues, seem to have a central role in the regulation of acid secretion, as confirmed by the widespread use of H2 receptor blockers in the therapy of acid-related disorders [16, 17]. Histamine plays an important role in gastric inflammation acting via the H2 receptor, although H. pylori infection is one of the major contributing factors to the development of gastro-duodenal inflammation . Recently, the association between genetic polymorphisms of histamine receptor genes and susceptibility to schizophrenia, and its clinical response to clozapine treatment has been studied . This investigation of the polymorphisms of HRH2, coding for the H2 receptor, reveals association between the genotype at the HRH2 -1018 G/A locus (rs2607474) and clinical response to clozapine treatment. In addition, this report has shown that rs2607474 is located in an enhancer element of the HRH2 gene promoter [19, 20] and it is thus likely that this variant induces changes in the expression of receptors. According to HapMap-JPT, there is only one linkage disequilibrium (LD) block, composed of rs686874, rs2067474, rs678591, rs645574, rs2890892 and rs11954815, in HRH2. All the other SNPs are minor polymorphisms. Therefore, we speculated that this LD block influence the expression and/or function of histamine H2 receptor and selected rs2607474 as a Tag SNP. There has not yet been any report on the rs2607474 affect on the development and progression of gastrointestinal disorders. We hypothesized that the rs2607474 may influence the development of aberrant DNA methylation patterns in gastric mucosa. In the present study, we investigated the relationship between HRH2 promoter polymorphism (rs2607474) and DNA methylation of DAPK and CDH1 in non-cancerous gastric epithelium. The difference of DNA methylation status among gastric cancer patients and non-cancerous subjects was also investigated. Our studied population comprised 527 subjects (412 without malignant tumors and 115 with gastric cancer) recruited from the Endoscopy Center of Fujita Health University Hospital or Kanazawa Medical University Hospital. Patients with systemic severe diseases were excluded from this study. Those with active gastric or duodenal ulcers were also excluded. All subjects underwent upper endoscopy with biopsy from non-cancerous mucosa. In 115 subjects with gastric cancer, biopsy specimen was also obtained from cancer lesion. Parts of each specimen were immediately frozen and stored at −80°C, while some of the other part was fixed in 10% buffered formalin and embedded in paraffin. Later, Genomic DNA was extracted directly from frozen specimens using standard phenol/chloroform method after proteinase K digestion. In 296 of 412 subjects without gastric cancer, the severity of chronic gastritis was classified according to the updated Sydney system  by a pathologist who had no access to any clinical information. H. pylori infection status was assessed by serology, histology, or urea breath test. Subjects were diagnosed as infected when at least one of the diagnostic tests was positive. To examine DNA methylation, genomic DNA was treated with sodium bisulfite using BislFast DNA Modification Kit for Methylated DNA Detection (TOYOBO, Co., Ltd., Osaka, Japan). MSP for DAPK and CDH1 were carried out using the methods reported by Katzenellenbogen et al. and Herman et al. , respectively. In brief, MSP reactions were carried out with the following primer pairs using EX Taq HS (Takara Bio, Inc., Shiga, Japan). Annealing temperature and times were determined using DNA from peripheral blood of a young individual without H. pylori infection as a negative control and this DNA methylated with SssI methylase (NEW ENGLAND BioLabs Inc., Beverly, MA) as a positive control. The MSP was carried out in a volume of 20μL containing 0.1 μg of bisulfite-modificated DNA. The DNA was denatured at 95°C for 5 minutes, followed by 35 cycles at 95°C for 30 seconds, 64 or 65°C (for CDH1 or DAPK, respectively) for 1 minutes, and 72°C for 1 minute with a final extension at 72°C for 5 minutes. The bands of MSP were detected by electrophoresis in 3.0% agarose gels stained with ethdium bromide. Hypermethylation was defined as the presence of a positive methylation band showing signals approximately equal to or greater than that of the size marker (10 ng/μL: 100 bp DNA Ladder, Takara Bio, Inc., Shiga, Japan) regardless of the presence of unmethylated bands . The rs2607474 was genotyped by PCR-SSCP as reported previously [24, 25]. To detect the genotype, using the primer pair (forward: 5′-acctgacccttttctgaaaaagtttgtc-3′, and reverse: 5′-ctactcctctgaagtgctgagaaccat-3′), PCR was carried out in a volume of 20 μL containing 0.1 μg of genomic DNA. The DNA was denatured at 95°C for 3 minutes, followed by 35 cycles at 96°C for 15 seconds, 60°C for 30 seconds, and 72°C for 30 seconds, with final extension at 72°C for 5 minutes. Thereafter, 2 μL of PCR product was denatured with 10 μL of formamide (Sigma-Aldrich Co., St. Louis, USA) at 95°C for 5 minutes. SSCP was carried out at 6°C using a GenePhor DNA separation system with GeneGel Excel 12.5/24 (GE Healthcare, USA), after which the denatured single strand DNA bands were detected using a DNA Silver Staining Kit (GE Healthcare). We confirmed that single strand DNAs were clearly separated by this condition . SSCP results were confirmed using positive DNA fragments prepared by nested-PCR as reported previously [24, 26]. Age and updated Sydney system scores were expressed as mean ± SD. Mean ages between two groups were compared with Student’s t test. The ratio of gender, H. pylori infection and DNA methylation were compared using Fisher’s exact test. The allele counts were also compared between the methylated and the unmethylated groups by Fisher’s exact test. Adjusted ORs were calculated with the use of logistical regression analysis after adjustment for age, gender and H. pylori infection status. Each updated Sydney system scores among 2 groups was compared by Mann Whitney U-test. The correlation between age and each updated Sydney system score was assessed by ANOVA. For all analyses, the level of significance was set at p < 0.05. A total of 412 non-cancer (non-GC) subjects and 115 gastric cancer (GC) patients participated in this study. These characteristics are summarized in Table 1. The mean age and male/female ratio of the GC group were significantly higher than those in the non-GC group. The H. pylori positive ratio of the GC group was also significantly higher than that of the non-GC group. Furthermore, the frequencies of CpG methylation of both DAPK and CDH1 were significantly higher in the GC group than in the non-GC group. *: non-GC group vs. GC group. The distribution of this genotype in all 527 subjects was 401GG, 119GA and 7AA and was in Hardy-Weinberg equilibrium (p = 0.70). The mean age, H. pylori positive ratio and GC/non-GC ratio were significantly higher in the DAPK methylated than in the unmethylated groups, whereas the male/female ratio among the two groups was not significantly different (Table 2). The minor allele frequency of rs2607474 in the methylated group was significantly lower than that in the unmethylated group (p < 0.0001, setting α = 0.05, 1-βpower = 0.978). In addition, the frequency of the GG homozygote was significantly higher in the methylated group than in the unmethylated group (p < 0.0001). *: unmethylated vs. methylated, #: frequency of GG homozygote. The H. pylori positive ratio and GC/non-GC ratio were significantly higher in the CDH1 methylated group than in the unmethylated group, whereas mean age and male/female ratio among the two groups were not significantly different (Table 3). The minor allele frequency of rs2607474 in the methylated group was significantly lower than that in the unmethylated group (p = 0.0004, setting α = 0.05, 1-βpower = 0.946) and the frequency of the GG homozygote was significantly higher in the methylated group than in the unmethylated group (p = 0.013). Overall, rs2607474 GG homozygote conferred a highly significant increased risk for the development of DAPK methylation (OR, 2.43; 95%CI, 1.60-3.69; p < 0.0001; Table 4). In the non-GC subjects, the GG homozygote also showed a significantly increased risk for the development of DAPK methylation (OR, 2.61; 95%CI, 1.62-4.20; p < 0.0001). However, it displayed neither a significant risk in non cancerous mucosa nor in cancer lesion in subjects with GC (Table 4). The frequency of DAPK methylation was not significant different between non cancerous mucosa and cancer lesion in subjects with GC (95/115 vs. 104/115, p = 0.12). (): the number of subjects. On the other hand, rs2607474 GG homozygote was associated with a significantly increased risk for the development of CDH1, as well as DAPK, methylation (OR, 2.07; 95%CI, 1.35-3.17; p = 0.0009; Table 5). In the non-GC subjects, the GG homozygote was also associated with a significantly increased risk for the development of CDH1 methylation (OR, 2.25; 95%CI, 1.35-3.75; p = 0.0019). However, it exhibited neither a significant risk in non cancerous mucosa nor in cancer lesion in subjects with GC (Table 5). The frequency of CDH1 methylation in the subjects with GC was significantly lower in cancer lesion than in non cancerous mucosa (78/115 vs. 96/115, p = 0.009). (): the number of subject. In subjects younger than 60 years of age, rs2607474 GG homozygote conferred a slightly, but significantly, increased risk for DAPK methylation (OR, 2.12; 95%CI, 1.13-3.98; p = 0.020, Table 6), whereas not for CDH1 methylation. However, the GG homozygote showed a significantly increased risk for the development of both DAPK and CDH1 methylation in subjects older than 60 years (OR, 2.72; 95%CI, 1.55-4.80; p = 0.0005 and OR, 2.81; 95%CI, 1.53-5.17; p = 0.0009, respectively, Table 6). In H. pylori negative subjects, rs2607474 GG genotype was associated with an increased risk for the methylation of both DAPK and CDH1 (OR, 2.70; 95%CI, 1.31-5.57; p = 0.0074, and OR, 4.43; 95%CI, 1.76-11.1; p = 0.0016, respectively, Table 7). However, the GG homozygote displayed an increased risk for the development of DAPK methylation in H. pylori positive subjects (OR, 2.29; 95%CI, 1.36-3.86; p = 0.0018), but not for CDH1 methylation. by logistic regression analysis after adjustment for age and gender. Overall, there were no significant differences in atrophy or metaplasia scores between the GG homozygote and the GA + AA genotype (Figure 1). However, in subjects older than 60 years of age, both scores were significantly higher in the GG homozygote than in the GA + AA genotype. Comparisons of Sydney system scores among GG homozygote and GA + AA genotype. Overall, neither atrophy nor metaplasia scores were significantly different among GG homozygote and GA + AA genotype. However, in the subjects older than 60 years, both scores were significantly higher in GG homozygote than in GA + AA genotype. Both atrophy and metaplasia scores were strongly correlated with age in the GG homozygote (both p < 0.0001 by ANOVA, Figure 2a, b), whereas there was no such correlation between age and either score in the GA + AA genotype (p = 0.76 and p = 0.69, respectively, Figure 2c, d). Association between rs2607474 and gastric mucosal atrophy. 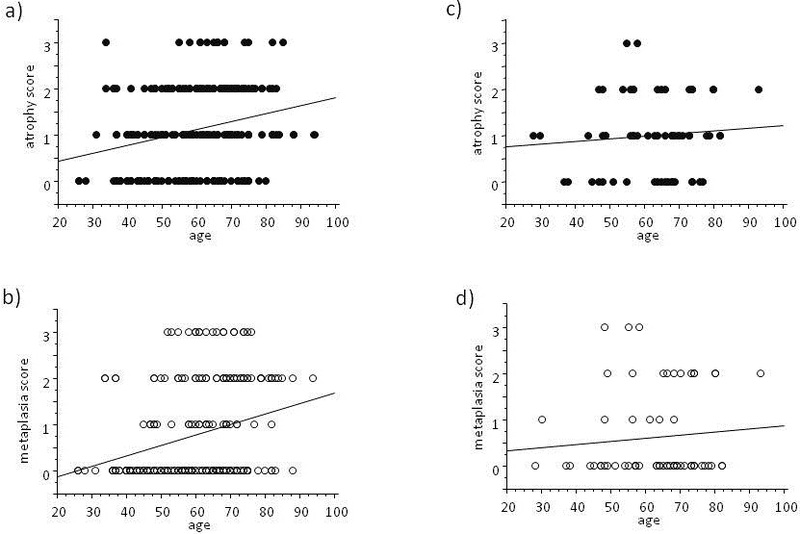 a: Correlation between age and atrophy score in GG homozygote Atrophy score was significantly correlated to the age (p = 0.0001 by ANOVA, n = 233). b: Correlation between age and metaplasia score in GG homozygote Metaplasia score was significantly correlated to the age (p < 0.0001 by ANOVA). c: Correlation between age and atrophy score in GA + AA genotype. There was no significant correlation (p = 0.47 by ANOVA, n = 63). d: Correlation between age and metaplasia score in GA + AA genotype. There was no significant correlation (p = 0.48 by ANOVA). We have previously reported that CpG island methylation of both DAPK and CDH1, in non-neoplastic gastric mucosa, corresponded to an increased risk of gastric cancer . In the present study, the frequency of methylation in both genes was significantly higher in the subjects with GC than without GC. However, the frequency of CDH1 methylation in cancer lesion was significantly lower than that in non cancerous mucosa in the subjects with GC, although the frequency of DAPK methylation was not. From these findings, CDH1 methylation seems to take little part in the development of gastric cancer. In our studied subjects, gene methylation may not reflect the expression of protein or mRNA, although some previous studies demonstrate that these gene methylations contribute to decreasing levels of protein and mRNA [27–30]. Another possibility is that tumor may develop through E-cadherin independent pathways for carcinogenesis. The mechanism of carcinogenesis via gene methylation is still unclear. However, we pay attention to the fact that accumulation of gene methylation actually shows an increased risk of carcinogenesis as many studies have indicated [3, 4, 6, 7, 11–14, 31, 32], even if methylation of CDH1 may not directly affect the tumor development. There are few reports that demonstrate an influence of polymorphisms of HRH2 on the risk for human disorders, but those there are report no association between rs2607474 and neurological or psychological disorders, such as schizophrenia or Parkinson’s disease [19, 20, 33]. We are unaware of any previous reports on the association between this polymorphism and gastric disorders.In the present study, we investigated the association between rs2607474 and the developments of CpG island methylation of both DAPK and CDH1 in non-cancerous gastric mucosa. Our current study reveals that rs2607474 GG genotype was positively associated with the development of CpG island methylation of both genes. In addition, we also reveal that gastric mucosal atrophy is more severe in comparatively older GG homozygote than GA + AA genotype, and that gastric mucosal atrophy progresses with age only in GG homozygote. One of the most important factors causing gene methylation in the stomach is H. pylori infection . Infection with H. pylori first induces chronic superficial gastritis, which can progress to chronic atrophic gastritis, intestinal metaplasia, and dysplasia that can lead gastric carcinoma . The factors promoting H. pylori-mediated gastric atrophy are somewhat more controversial. H. pylori infection results in an elevation of serum gastrin level, in the early stage of infection, and proceeds to the development of atrophic gastritis. The majority of clinical studies, however, have accepted that proton pump inhibitors (PPIs), which induce achlorhydria and hypergastrinemia, accelerate the onset of atrophic gastritis in H. pylori positive patients [35–37]. Therefore, hypergastrinemia seems to promote the gastric mucosal atrophy that is influenced by H. pylori infection. Interstingly, long-term treatment of rats and mice with loxtidine, a potent H2 receptor antagonists inducing ECL cell hyperplasia, (as does omeprazole), did not result in loss of parietal cells, but instead appeared to result in increased parietal cells [38, 39]. In addition, HDC knockout mice kept on a low-histamine diet showed an expanded parietal cell pool despite exhibiting marked hypergastrinemia . These results suggest that it is the up-regulation of histamine, not achlorhydria nor hypergastrinemia, that contributes to the gradual down-regulation of parietal cell number and gastric atrophy. In our present study, gastric mucosal atrophy progressed with age in rs2607474 GG homozygote cohort, whilst in the GA + AA genotype it did not. In addition, the degree of gastric mucosal atrophy was higher in older subjects who were the GG homozygote than in those that were the GA + AA genotype. In our previous study, a correlation between intestinal metaplasia and gene methylation of various genes has been confirmed . We therefore suggest that gene methylation progresses more rapidly in parallel with gastric mucosal atrophy in the GG homozygote than in the GA + AA genotype. Furthermore, it is possible that the action of histamine is up-regulated in GG homozygote. However, there have been no studies for the effects of rs2607474 on function or expression of H2 receptors and our genetic statistical study did not reveal them. This is one of the limitations in our study. Further study using other methods and other techniques are necessary to evaluate the function of rs2607474. It has been recently reported that GC patients show higher frequencies of aberrant CpG island methylation in non neoplastic mucosa than non-GC subjects . In our present study, the frequencies of DAPK and CDH1 methylation were also significantly higher in subjects with GC than without GC. On the other hand, rs2607474 GG homozygote was associated with a significantly increased risk for both DAPK and CDH1 methylation in subjects without GC, whereas it wasn’t in subjects with GC. The methylation frequency of DAPK and CDH1 was higher in GC patients than in non-GC cases, and there were few GC patients without methylation of DAPK and CDH1 (20/115 and 19/115, respectively). That is, almost all GC patients have non-cancerous gastric mucosa in which some genes are already methylated. In addition, the cohort composed of only GC patient may have a certain kind of bias. Therefore, the influence of HRH2 genotype on methylation status of non-cancerous mucosa in patients who have already developed gastric cancer may be indistinct. A significantly increased risk of the GG homozygote for DAPK methylation was seen regardless of the age or H. pylori infection status, whilst that for CDH1 was not seen in the comparatively younger subjects or H. pylori positive subjects. Why such a difference was seen is unknown. The mechanisms which ageing or inflammation influences methylation are unclear. We demonstrated in this study that, in the GG homozygote, gastric mucosal atrophy was correlatively progressed with age and was more severe in the comparatively older subjects. As for one possibility, it might be hard for CDH1 methylation to undertake the influence of ageing or inflammation than DAPK methylation. 3In conclusions, the HRH2 promoter polymorphism rs2607474 influences the methylation status of DAPK and CDH1. These findings are observed in non-GC subjects, not in GC patients. The rs2275913 GG homozygote confers a significantly increased risk for age- and inflammation-related gene methylation of both genes. TA analyzed the data, wrote the paper and was responsible for the conception of the study and designed the study. TT participated in the design of the study. TN, together with HS, TM, YM, RH, KM, TO, MN, NT and TS obtained the samples and the data. All authors approved of the final manuscript prior to submission.